Welding students from the WLD 224 technical processes class at Arizona Western College helped to put on the workshop for the Southwest Ag Summit. They partnered with the Lincoln Electric Company and the local welding distributor WestAir to assist local Ag leaders in learning about welding implements with durable hard-surface materials to extend implement life. The students learned in advance of the program more detailed information about the welding equipment and consumables so that they could demonstrate for the attendees and explain the benefits of the products. Lincoln Electric experts helped with the classroom presentation. John Lopez, a 30-year-plus veteran of the industry, led the classroom presentation on implement repair and surfacing, supported by Alex Bautista, district manager for the Lincoln Company in San Diego. 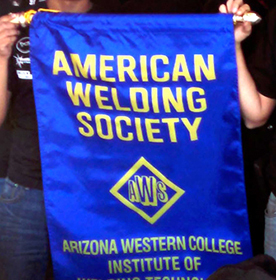 The students are part of the American Welding Society Student Chapter at AWC and support a number of competitions and outreach programs during the academic year. Their, professor, Sam Colton, says he realizes the value of these extraordinary student activities and, at the request of the Ag Summit organizing committee, has helped to organize the welding portion of the summit two years in a row.